Enfant Terrible wrote: I originally ordered a copy from the OS (for me). I'd also ordered a copy from the Faber website later (as a gift for my Dad - he has good taste!). He'll be getting the standard copy now! Thanks for this. I phoned today as still haven’t received my special edition - I am in the UK and received my despatch email over a week ago. Apparently these were recalled as were incorrectly labelled (likely the postage issue you outline above) and will be resent. My postage charge is being refunded. Page 93...Neil was "happy and in love.In the sixties and seventies"..BUT he said his first boyfriend arrived in late 80ies...so Neil was happy with girlfriend? 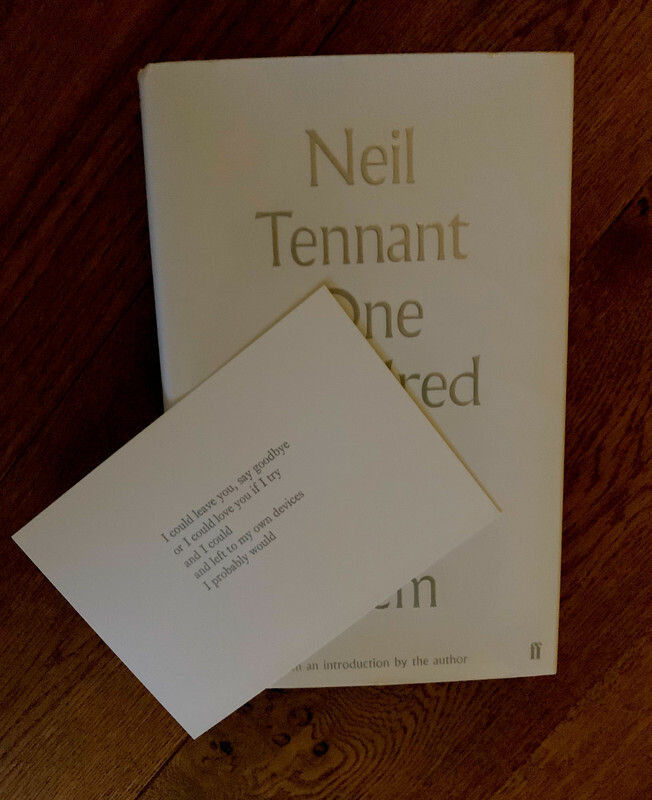 I finished reading whole Neil s comments in his book by the time he came on stage at Hackney, of course I was dissapointed that I did not discover "No More Ballads", "Inside",and specially no comments about his recent boyfriends.. I know "only young pop stars should talk about their lovelife". I think it's overstated how song lyrics don't work on the page. It's true that they flow better when you know the tune, but even if you don't know the tune, as long as you know that it is a lyric it's easy to make the adjustment of expectation that it's not necessarily going to have a regular poetic metre. I've enjoyed many collections of lyrics whether I know the tunes or not. Admittedly these are mostly other genres of lyric (either the likes of Cole Porter or W S Gilbert or the likes of Dylan) and Neil's might not stand up to scrutiny so well, but I'd be delighted to see if they do. As for the poem, he'd written it anyway, I think it's good, and it seems a logical home for it. I don't see the problem there. One Hundred Lyrics and a Meh. Calling it a 'beautiful little thing' is beyond poetic license (pun intended, naturally). only if neil said it did on the official site, actually. Each to their own (devices) obviously. Is anyone else still awaiting their limited edition yet..??? I got mine a few days ago. I wished for more additional text about each of the songs. I read the book within an hour.